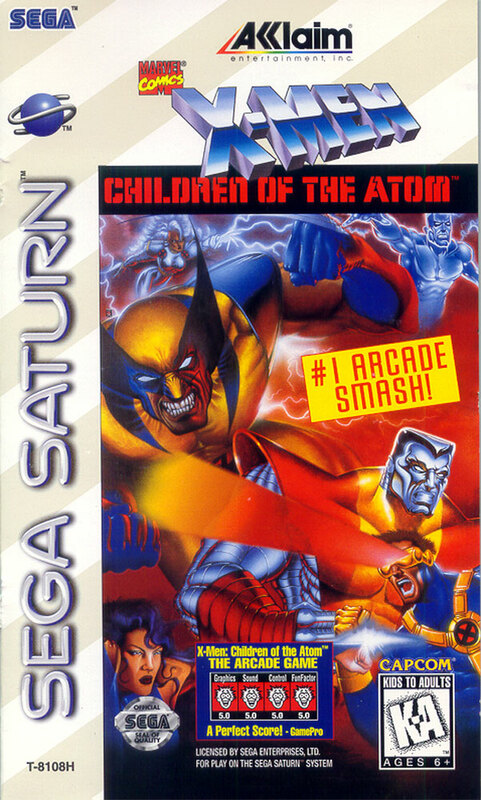 STORY: The game's plot is loosely based on the "Fatal Attractions" storyline. 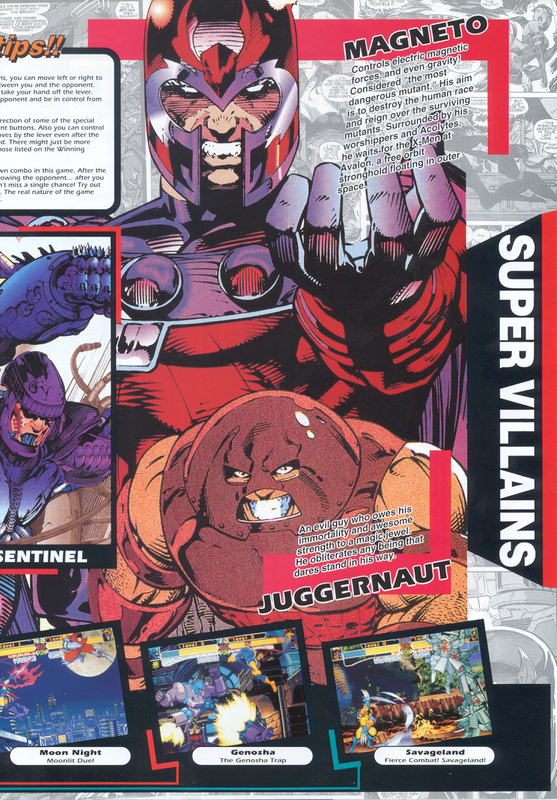 The main antagonist is Magneto, who plans to unleash an electromagnetic pulse on the Earth that will disrupt the magnetic fields and create havoc on the world's electrical systems ushering in a Dark Age for Earth's non-mutant population. 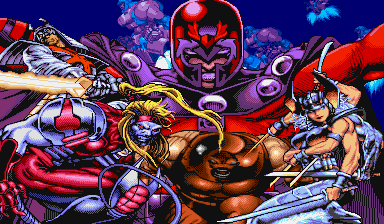 With the promise of a mutant-run planet, the X-Men's most formidable foes join forces with Magneto. 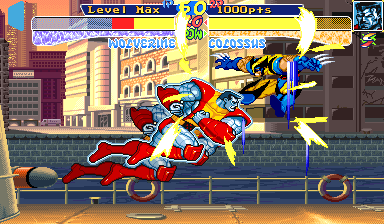 REVIEW: Capcom appealed to both fighting game and Marvel fans by turning Marvel's trademark X-Men franchise into a 2D fighting game, and an awesome looking one at that. 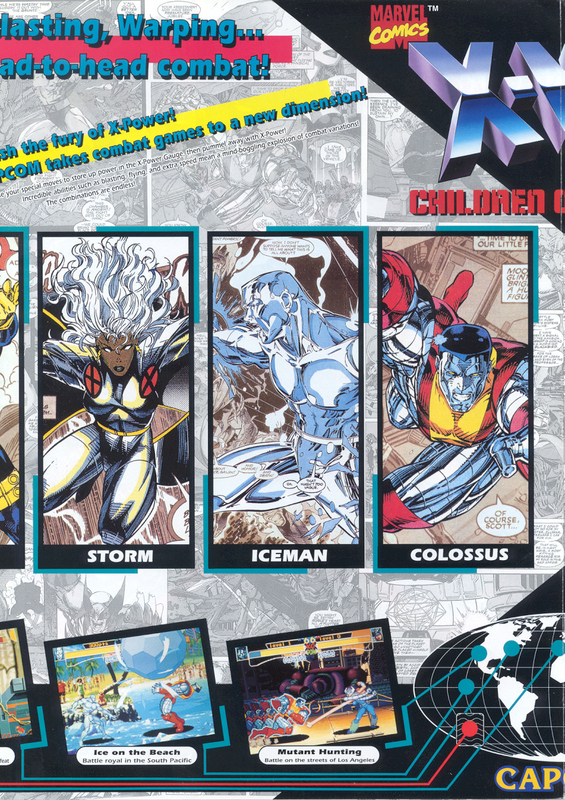 X-Men: Children of the Atom allows you to play as several heroes and villains from the X-Men series, in several amazing looking 2D worlds. 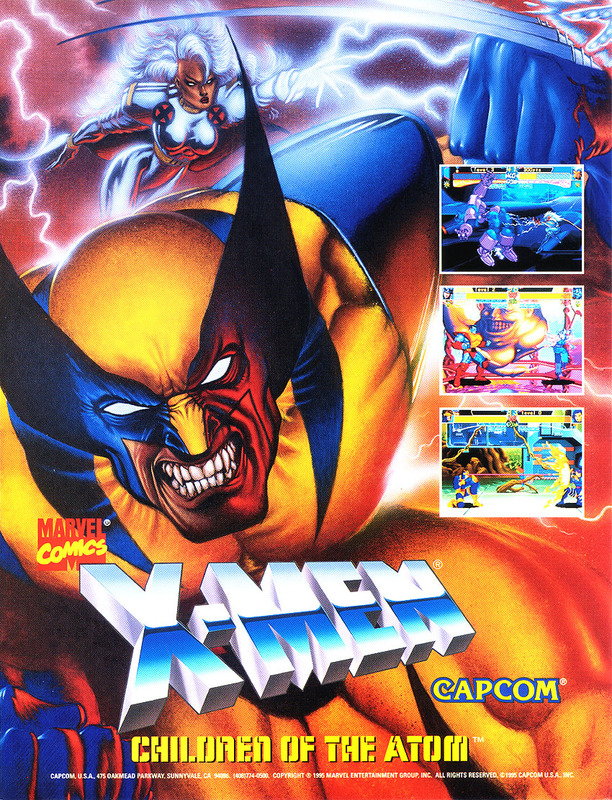 The game further cemented its authenticity and legitimacy by using voice actors from the X-Men animated series, such as Cathal Dodd as Wolverine. 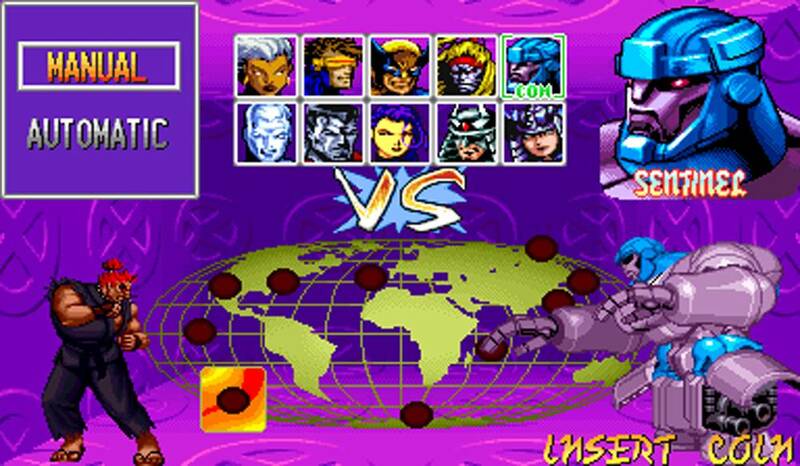 How could you not notice that selection screen at arcades. 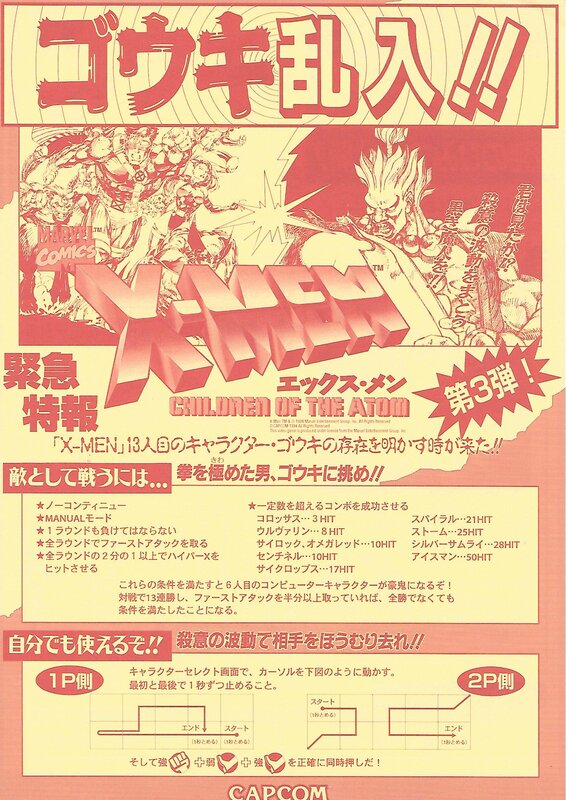 Right off the bat, you notice X-Men: Children of the Atom is eye-catching and visually leagues above many other fighting games at the time. 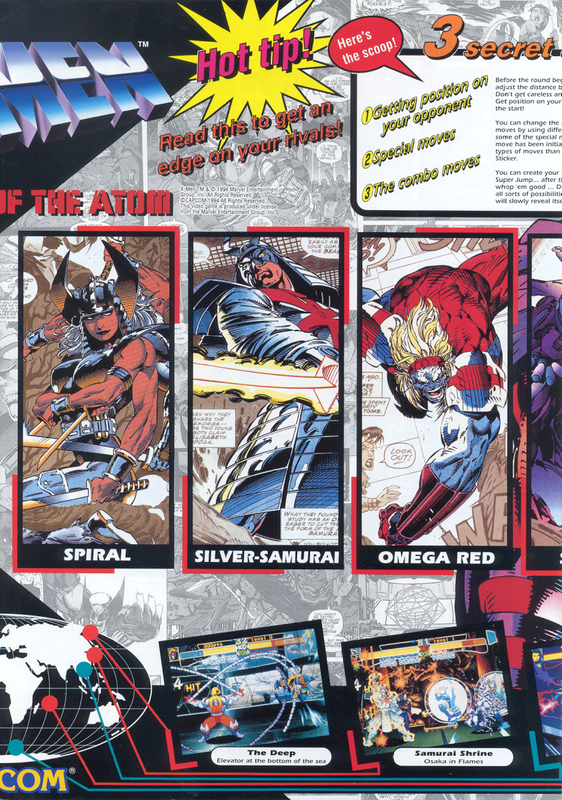 In motion, Children of the Atom shines even more. 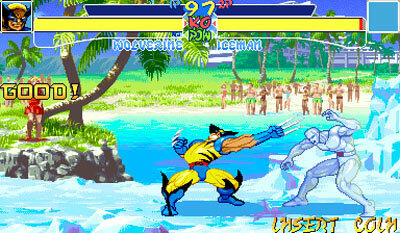 The iconic characters were given superb animation by some of Capcom's best artists. 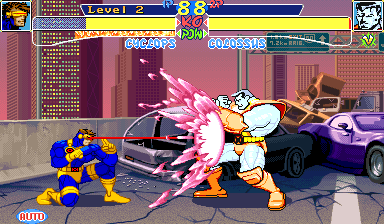 The way characters throw their attacks and dramatically get hit was a certainly a milestone, and no doubt a new benchmark to how 2D fighting game animation could be handled in a fighting game. 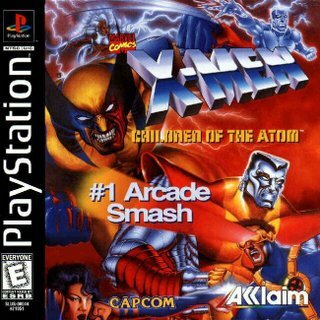 Not only was X-Men: Children of the Atom one of the best looking and hardest hitting 2D video games; the gameplay was also very innovative and offered some brand new ideas to fighting games. HUGE super moves. Welcome to the new era. 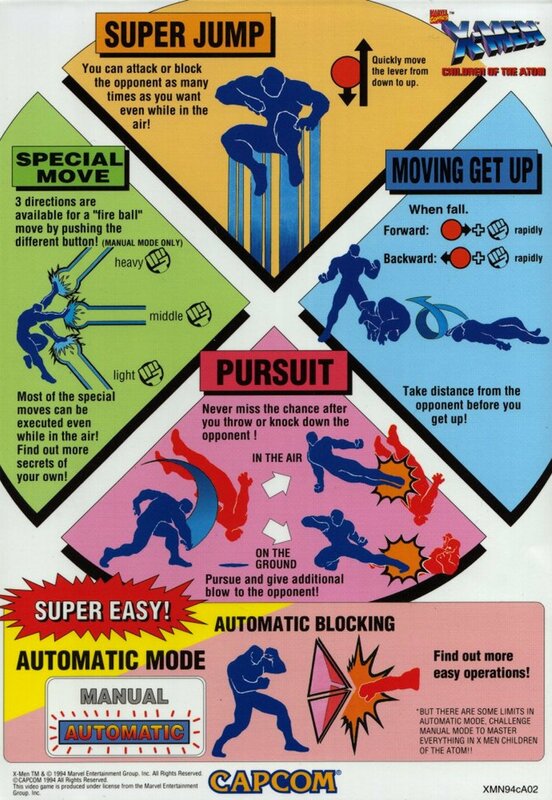 The gameplay basics of Children of the Atom derive from Capcom's Street Fighter series, of course. 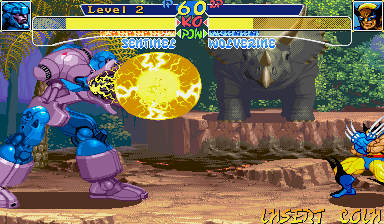 The "X-Power" gauge functions similarly to the Super combo gauge from Super Street Fighter II Turbo and the "Special" Gauge in Darkstalkers. 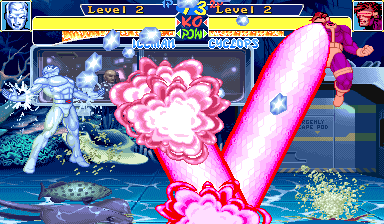 Players can then perform an "X-Ability", which consumes a small portion of the X-Power gauge, or a "Hyper X", which consumes a greater portion of the same gauge. 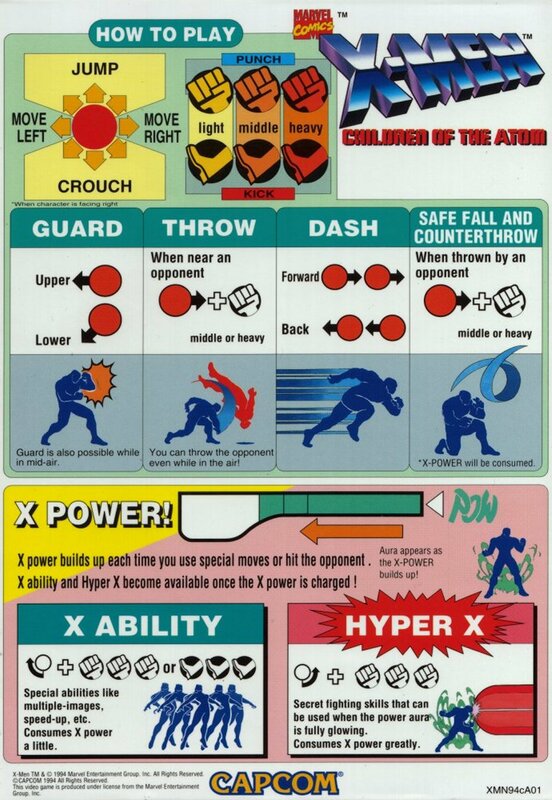 Breaking one's fall from a throw or performing a counter-throw will also consume a portion of the X-Power gauge when performed. 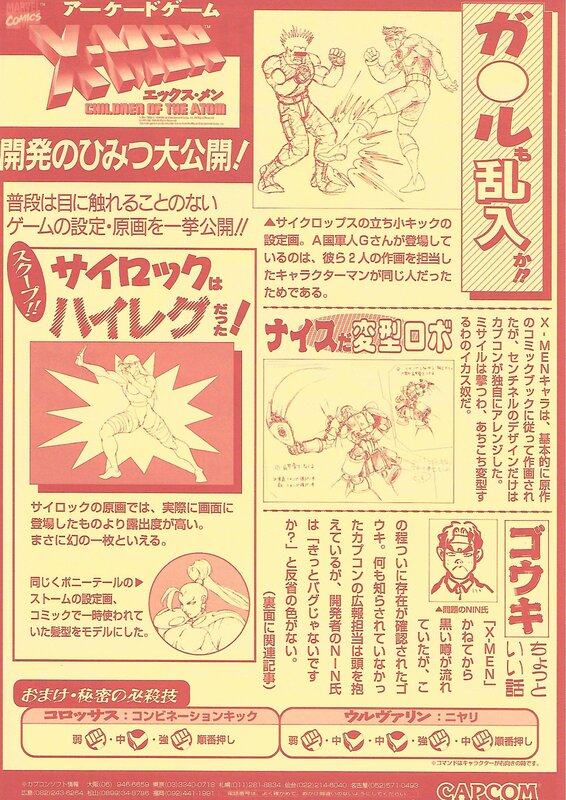 Soon to become a standard in Capcom's Marvel Versus series... Children of the Atom introduced "Super Jumps" for the first time in a fighting game, allowing fighters to leap extra high into the air. 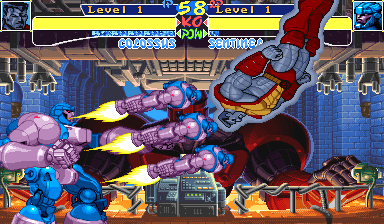 (Regular jumping is also allowed, as being able to mix up the height of your jumps is a great gameplay strategy). 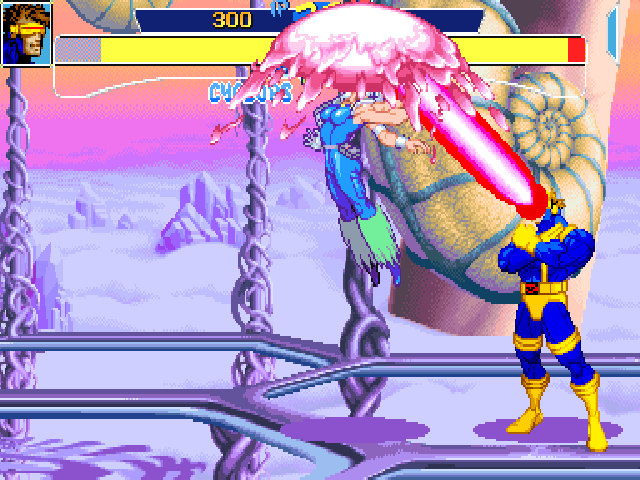 This technique promotes aerial combat (which makes sense in a superhero fighting game) and supports some incredibly fast-paced, frantic gameplay. 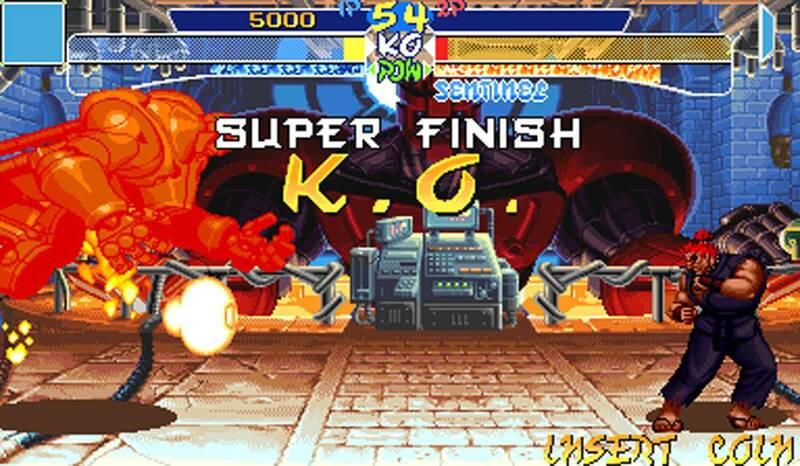 Big special moves, flashy super moves, and insane combos were other noticeable attributes about this game. 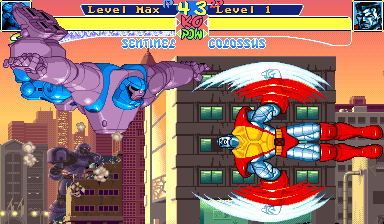 Other features introduced in Children of the Atom include the ability to roll away or towards an opponent after falling, and the ability to charge an opponent after throwing them for follow-up attacks. 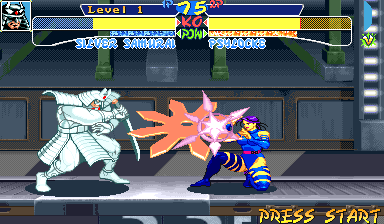 To make it easier for new fighting game players, the options of "manual" or "automatic" (blocking) are available after selecting a character. 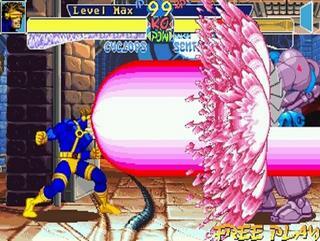 By selecting to automatically block attacks, certain features are not available during gameplay. 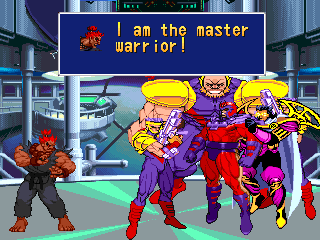 Akuma's epic cameo as a secret character... a sign of good things to come. 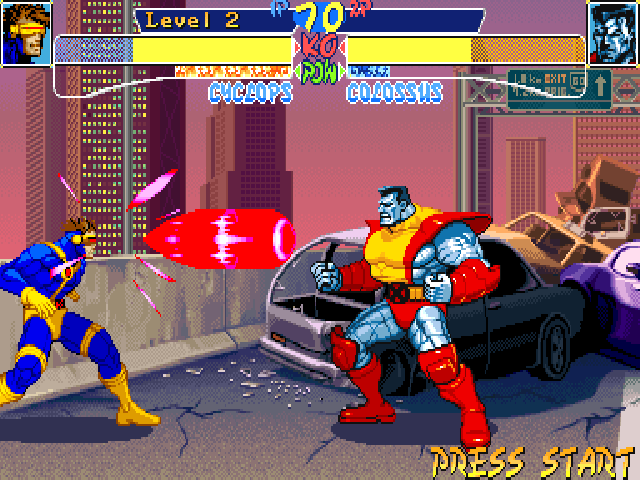 Capcom's contract with Marvel stipulated that Capcom include a character from the Street Fighter franchise in the game. 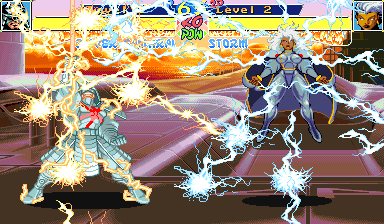 As the first-ever "crossover / guest" character to appear in a fighting game, Street Fighter's Akuma himself makes a appearance as a secret unlockable character (playable after inputting a secret code). 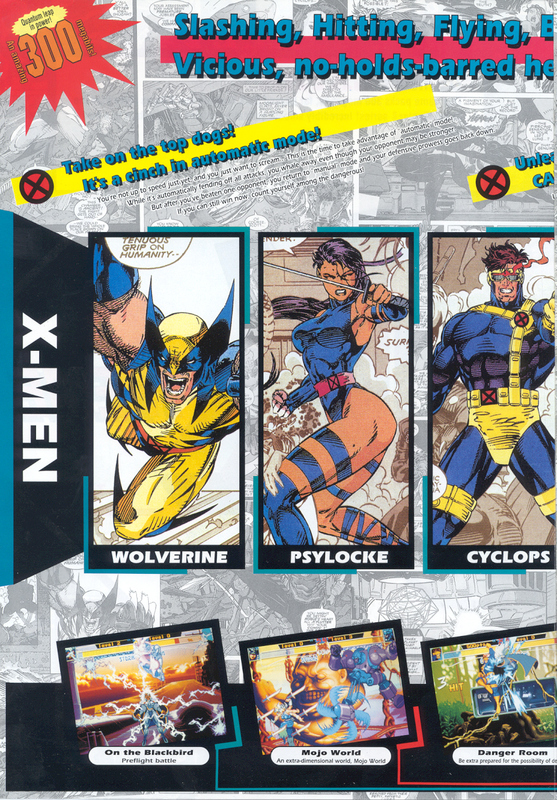 Several cameo characters also appear in some of the character endings, including: Professor X, Forge, Phoenix, and Mojo. 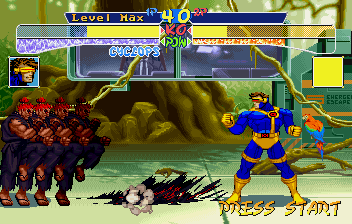 X-Men: COTA was unquestionably an innovative and influential 2D fighting game both visually and technically, spawning the VS Series gameplay system which would be used in many future Capcom fighting games. 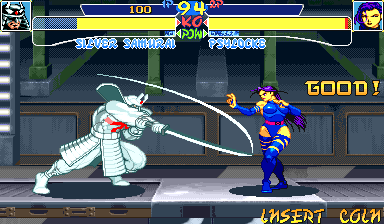 Visually, it put many other 2D fighting games to shame, especially certain console-only fighting games (Justice League: Task Force would be one of them). The only thing holding the game back from perfection were some gameplay imperfections and exploits. For one, players could not select the same character - a frustrating quirk for competitive players. 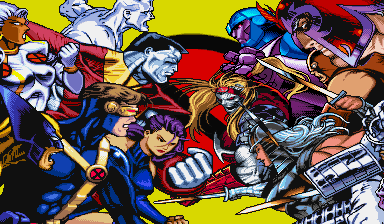 One of the only other notable flaws is the somewhat small character roster. 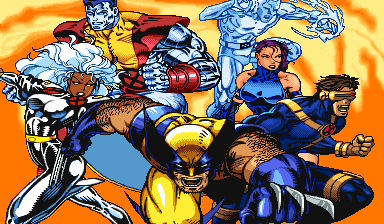 No doubt, die-hard Marvel fans could only ask for more X-Men and Marvel characters to be represented.